Taking advantage of some holidays in the heart of green Venice, Mr Loyal your servant decides to discover the surroundings. For my trip, I go to the office of tourism to buy a card IGN to steer me through this labyrinth of greenery. And also a topo-guide, a very beautiful book full of information about the history, the traditions, the fauna, the flora… all the things not to miss this beautiful territory. In the bend of a road I perceive a field filled with plants with high stalk which sharpen my curiosity. A man occupied with cutting these plants informs me : « you are in Angelica's field. 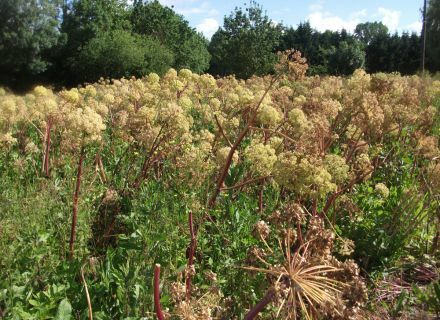 This plant which we cultivate here is called the archangelica Angelica (formerly Angelica medicinalis), of the family of ombellifères or apiacées. But why this name ? She owes her name of "herb of the angels" in its claimed magic powers. We say that it is a plant which liquefies the blood. It was formerly used to provoke internal bleedings at the women. Where from its other name of "herb backstreet abortionist". 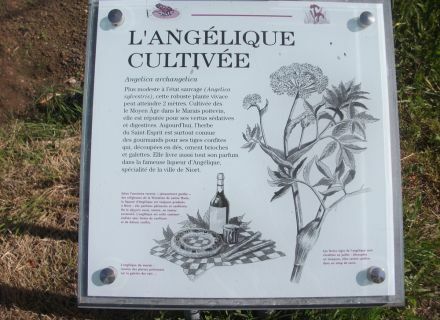 In 1603, the angelica was used to fight against the plague which rages in Niort and provoked the disappearance of 1/3 of the population. In the popular tradition, we said that the name of archangélique which was used in the Renaissance came because an archangel had visited a monk put to sleep to reveal him that the plant could be cured of the leprosy and the plague. We also attributed it the power to be cured of the fury. 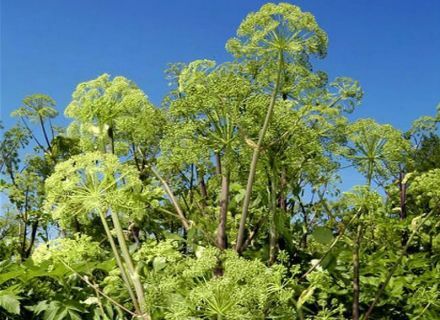 Finally, the angelica is a medicinal and aromatic plant of the same family as the parsley and the aniseed. The flavor reminds that of the gentian, the mint and the génépi. All the parts of the plant are edible. What is its origin ? We have difficulty in determining its origin. It seems come from cold, doubtless native of the North of Europe and of Asia from the North. Or still of Southern Europe. It was introduced in 12th century by the monks who fitted out the “Marais poitevin”. It is still cultivated in the swamp on the edge of Sèvre and along canals. It grows to the wild state but also becomes enlightened. It is a part of biennial plants and harvests in summer. She can achieve up to 2 metres in height. It possesses leaves with length pétiole, finely divided and hairy on their lower face. Flowers are arranged in an ombelle big. Flowers are greenish. It appreciates an ground rather wet and rich in humus, where from its installation in the swamp. She asks for not enough maintenance and is not sensitive to the diseases. At what end is it used ? In gastronomy the angelica enters the composition of numerous cakes. The most beautiful stalks of angelica cut level with the ground are used in confectionery. The finer stalks serve for making some syrup, candies, compotes and jams. The soft leaves can be used fresh to flavor salads and soups. Seeds and roots are also often used on infusion : it facilitates the digestion. It is enough to cut ombelles after the bloom (in June) and to air them. Distilled, we obtain essential oil intended for the aromatisation. Very interesting… And except the gastronomy ? This same essential oil enters the manufacture of cosmetics : soaps, shampoo, creams and balms. 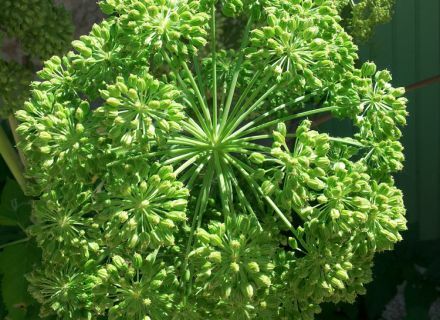 The angelica is invigorating and anti-stress. This plant is considered as its medicinal virtues. Its leaves, its roots and its seeds are used in phytothérapie against the fatigue and the problems of digestion, there notably the intestinal cramps. It seems whether it is a key product and whether it is important in the image of the swamp ! 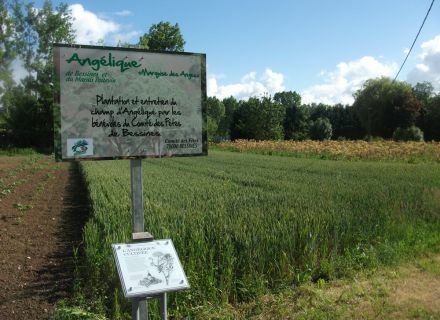 Effectively, we speak about her as the symbolic plant of the "Marais poitevin". It is the object even today of a relatively important business. Notably in Niort and its neighborhood where numerous companies of the sector cultivate it and put in the honor in cooking : crystallized stalks, liqueur, jam, compote, etc. 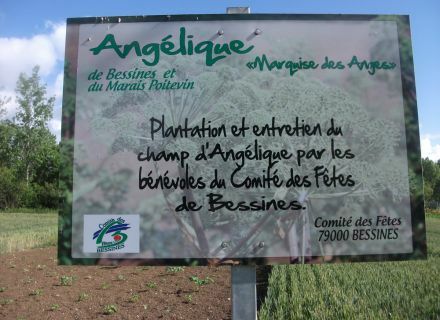 There is an association in the “Marais poitevin”, of which I am one of the members, who organizes its promotion as well as visit of the fields of angelica, in summer. It is the association of promotion of Angélique Niort Marais poitevin. 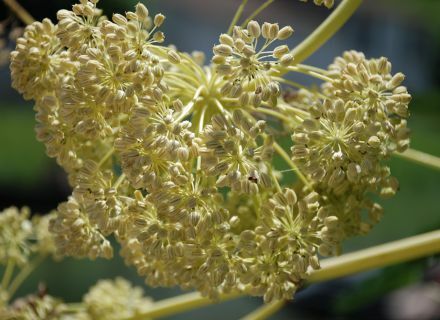 Every year in May, in the municipality of Bessines, a celebration of the angelica allows to collect the artisans and the lover of this plant. Here is Mr Loyal, I answered in a satisfactory way your curiosity ? Allow me to blow you a naming for this graceful, romantic and adventurous plant which inspires me "Angélique marchioness of plants" !!! Magnificent !, he said to me, and if you want to sample it you will find in most of the shops of regional products, grocer's shops, bakeries and offices of tourism of the “Marais poitevin" ». On these last words, I thank him and resume my road card in hand, in the discovery of the treasures of green Venice.